Is Egyptair also looking at B737 freighters? News released through Egyptian press services quotes Egyptair’s top man, Based Gohar, as stating that the carrier will add a further four converted Airbus A330-200Fs into their fleet and that they will also bring in a passenger (P2F) converted Boeing 737-800F into the fleet by 2019. Egyptair already has two A330-200 P2Fs on order with Dresden, Germany-based Elbe Flugzeugwerke (EFW) which will be delivered to the Cairo-headquartered airline in the very near future. The addition of further A330Fs will bring Egyptair into the big cargo carrier league in the Middle East. 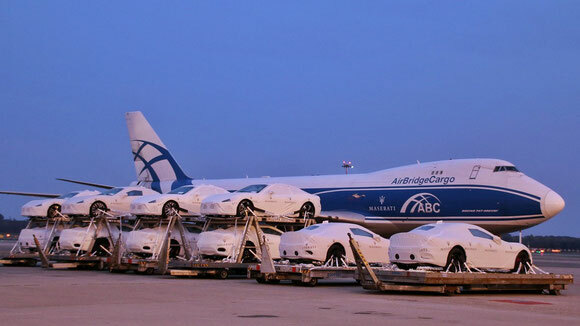 An AirBridgeCargo Boeing 747F charter flight on behalf of Agility Logistics brought twenty-eight newly produced Maserati Gran Turismo cars from Milan via Moscow to Tokyo. The vehicles were handled by Alha Airport MXP and positioned securely onto double-deck car racks to ensure the efficient use of space and safe transportation. ABC has developed and introduced special standard operating procedures for the transportation of vehicles, supported by a dedicated team of experienced professionals to ensure every delivery is handled with the highest attention. “We are honoured to be part of this project and to have been entrusted by the delivery of these magnificent Maserati cars. Our abcXL product was developed in close cooperation with our customers for such an operation to combine tried and tested principles with innovative ideas for efficient and reliable deliveries,” highlighted Sergey Lazarev, General Director of AirBridgeCargo Airlines. “The Agility team brought meticulous planning and handling to this challenge, knowing that anything less wouldn’t be good enough. ABC has been a trustworthy and reliable partner during each phase of the project with a high level of service quality and collaboration,” said Essa Al-Saleh, President and CEO, Agility Global Integrated Logistics. In the first nine months of 2017, ABC transported over 45,000 tons of vehicles and automotive spare parts across its global network. The Spanish cargo operator Swiftair which already operates a fleet of seven Boeing 737 freighters, has announced that they are taking another B737-400F on a short term contract from Icelandic operator, Bluebird Cargo. The lease from Bluebird is on an ACMI basis and can be extended for a further six months if both parties agree at a later stage. Swiftair’s B737 freighter fleet presently consists of six -400Fs and one aging -300F aircraft. On top of that the carrier which was founded in 1986 also operates various ATR 72 and Embraer 120 aircraft on regional routes in Europe, North Africa and the Middle East. 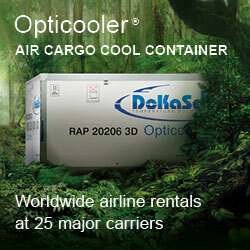 Some of these aircraft are on lease to other carriers. Latin America market coming out of the slump? The above could well be the case when looking at the latest outlook for the last quarter of this year. Reports indicate that Latin American carriers are finally seeing increases in international traffic and that surprisingly enough, the first half year traffic went up just over 9% compared to last year. July and August showed a 11% and 9.3% rise respectively. Brazil, Argentina, Peru and Ecuador are the main winners with Venezuela lagging far behind. Hopefully this also indicates that cargo tonnages are also on the way up although recent statistics show them standing far behind other areas. 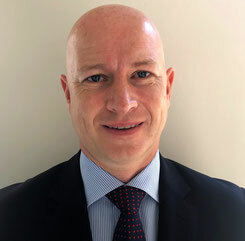 Menzies Aviation has appointed Jonathan Clark as CEO for their subsidiary Air Menzies International (AMI). 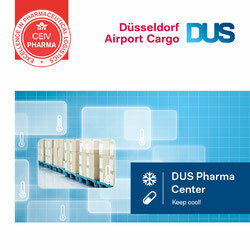 Mr Clark has been active in the airfreight business for over 30 years and previous positions held were with MSAS Cargo International, Lufthansa, Qatar Airways, DB Schenker. His last position was as Director Africa for Cargolux Airlines, a position he has held since 2016. AMI has since its inception in 1976 been providing freight agents and courier companies with what they term as “tailor-made wholesale capacity at competitive rates.” Other services include Customs brokerage and security screening for air cargo.